Founded in 2011, Blue Bubble Lettings is an independent lettings agency based in Ocean Village Marina, specialising in residential properties in Southampton and the surrounding areas. With fantastic online reviews and numerous industry awards, we have an unrivalled reputation for great customer service coupled with some of the lowest Landlord and Tenant fees in the industry. The ethos behind the foundation Blue Bubble Lettings Limited was to set up an ethical agency; one that wasn’t obsessed with the pursuit of fees or profit but one that focussed on clients and their needs. The secret to our success is, without a doubt, the loyalty of our clients. Almost all of our business is generated through recommendation, something we are extremely proud of. 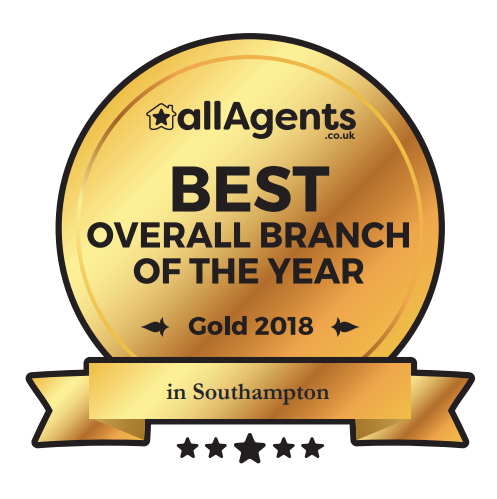 We have won a number of nationally recognised awards including the ‘AllAgents’ “Best Lettings Agent in Southampton” for the last 5 years. Once again Blue Bubble Lettings Limited came out in 1st place in the independent All-Agents.co.uk rankings for 2018. This ensures the security of client moneys and provides both landlords and tenants with a 3rd party arbitor in case of dispute at the end of any tenancy. Further information on the Deposit Protection Service is available on their website by clicking on the DPS logo to the right. The current guidance for tenants with regards to deposits, disputes and damages and the custodial scheme can be downloaded from the helpful information section of our website. We are regulated by The Property Ombusdman and adhere to all the required Codes of Practice that such regulation brings. Further information is available from The Property Ombudsman's website. Click on the image to the left to open the website in a new brwoser window. Blue Bubble Lettings Limited are members of the CM Protect client money protection scheme. Full details of the scheme can be found on the CM Protect website by clicking o the padlock icon on the left. Our current membership certifcate and Client Money Handling Policy are available for download from the helpful information section of our website. The panels below provide links to documents and resources that you need access to either as a landlord, a tenant or just a visitor to our site. Thank you for your email. We will respond to you as quickly as we possibly can.